A near-eradication of sunflower sea stars during a epidemic has uncovered their importance in the survival of kelp forests, according to a study. 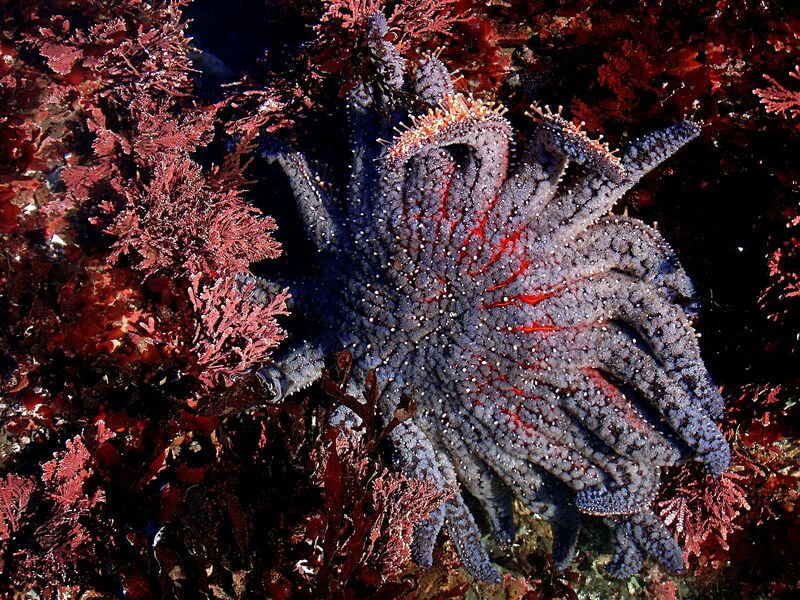 The sunflower sea star has an important role to play in the kelp forest's survival. Together with sea otters, sea stars play essential roles in the kelp forests' defence against sea urchins. This is the conclusion that researchers from Simon Fraser University reached after studying how a severe outbreak of disease affected the sea urchin population and kelp forest density. Their findings have been published in the recent issue of Proceedings of the Royal Society B journal. Kelp forests remove carbon dioxide from the atmosphere and serve as a habitat for many marine species. The kelp forests in British Columbia are one of the most productive ecosystems on Earth. However, they face a threat in the form of sea urchins, which can swiftly devour kelp forests. In British Columbia, the sea urchin population is kept in check by natural predators: sea otters feed on large sea urchins, and sunflower sea stars feed on the small and medium-sized ones. Then, came the epidemic of sea star wasting disease in 2015 and 2016. As much as 96 percent of the sunflower sea star population on the Central coast of British Columbia was wiped out. Interestingly, it was the sea star's near-total eradication by this epidemic that brought to light their importance in the ecosystem. In its wake, the small and medium-sized sea urchins flourished—their population rose by as much as 311 percent, and this subsequently led to a 30 percent decrease in kelp density. “We call them [sunflower sea stars] the cleanup crew. By mopping up the smaller urchins that sea otters leave behind, sunflower stars are having a positive indirect effect on kelp abundance, which overall is enhancing the resilience of coastal kelp forests," said Burt, in a Vancouver Sun article. The study also highlights the importance of long-term monitoring of ecosystems. “We need long-term monitoring programs that provide critical baseline data and enable researchers, government, industry and coastal communities to know how ocean systems are responding and changing in an increasingly unpredictable world," she added.